So the Christmas party came and went. It wasn't that bad. I was very glad I missed the events of the afternoon, pictures of which formed a never-ending slide show. The food was good. I drank enough to look like I was almost participating, but not enough to put me out of commission for the next day (which, I'm guessing, is less than it once was). One of my older colleagues impressed me as she told me about her vinyl collection (5000 records). The event didn't finish till midnight and some people would have carried on at some establishment (The Establishment?) on Courtenay Place, but I sloped off at about nine. The chances are (70%?) I won't be attending next year's party. I got an email on Friday that made me a bit more optimistic about 2014. It wouldn't take much (just one or two lowish-probability events that appear to be outside my influence!) for things get much better, and for all kinds of possibilities to open up, and break the cycle of impossibility that I've found myself in. On Thursday night another British guy took a look at my flat. He'd seen the Pak 'n' Save ad, not the TradeMe one; the demographics of the two would be slightly different. He'd be a bit older than the other guy, maybe my kind of age. He worked as a tree surgeon and was still in his work clothes. I'd be more than happy for him to move in, but it seemed he needed somewhere a bit sooner than I could offer. I feel a bit funny showing people around (although it was easier with him than the younger bloke). Why has he got this much space to himself? Did his wife leave him and take the kids with her? Mum and Dad will be spending Christmas with me. They're staying from the 22nd (next Sunday) to the 28th. I'm looking forward to it. My cousin wants us to go over to their place but my parents aren't that keen, and neither am I. We want to keep things as low-key as possible, especially after last year when things got high-key rather quickly. I played a lot of MGMT on my week off. Yesterday I heard a song by Elton John on the radio called Grey Seal - luckily it was on the Sound and I was able to search their playlist and find it. I'd only ever heard it a couple of times before. Great song, even though I'm not sure what the lyrics mean. I must check out more of his stuff. 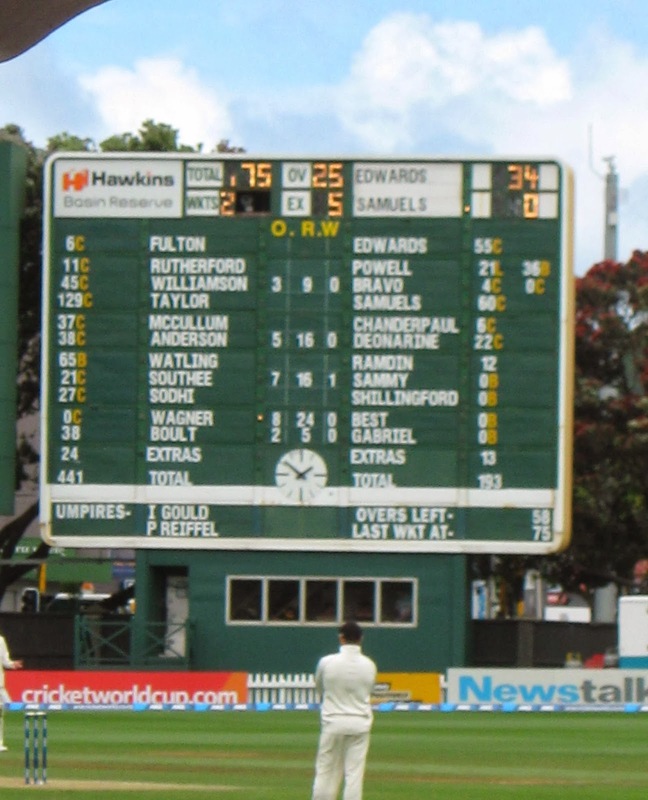 I didn't go to the cricket but I snapped this picture of the scoreboard on Friday - the third, and as it happened, last day of NZ's win over the West Indies. It doesn't make happy reading for the Windies - you can see that their last four batsmen were all bowled for a duck in the first innings, and they were forced to follow on. I note that they had both a Samuels and a Sammy on the team - there must be some joke there about playing it again. Tomorrow the autism group have their Christmas party. Plenty of new faces have appeared this year, and some have gone too. The only male facilitator we had - the one whose football team reached the semi-finals of the Chatham Cup - left because he was too busy. That's a shame - he was a thoroughly nice bloke, and he provided some balance to the other facilitators.